Hacking is a mysterious and common word today with increased number of websites and people having become the victim of hackers. So when I was assigned the task of hacking a VoIP phone as a part of the interview process for a security company, I was at the end of my wits. So let me explain how I approached and solved the task. So using this clue, I was able to ssh into the phone with user: admin and password: admin. But the shell that I entered had limited access. So I used nmap to search for all the open ports on the device. The above information helped me know which services are running and their version information. I used this information to check the Internet and see if there were any remote execution bugs but was unable to find any. I still had not found any use for the second part of the first clue h1m0mz. I accidentally entered this in the terminal, and this showed up in the terminal. This is a challenge-response authentication system, and I had no idea about the secret key that I needed. So I looked at the second clue. You might want to do some soldering. I started examining the PCB of the phone, after close inspection I came to the conclusion that the only part that could exploit was the SPI serial flash. I also found it hard to locate the datasheet for the chip as the markings were not very clear. 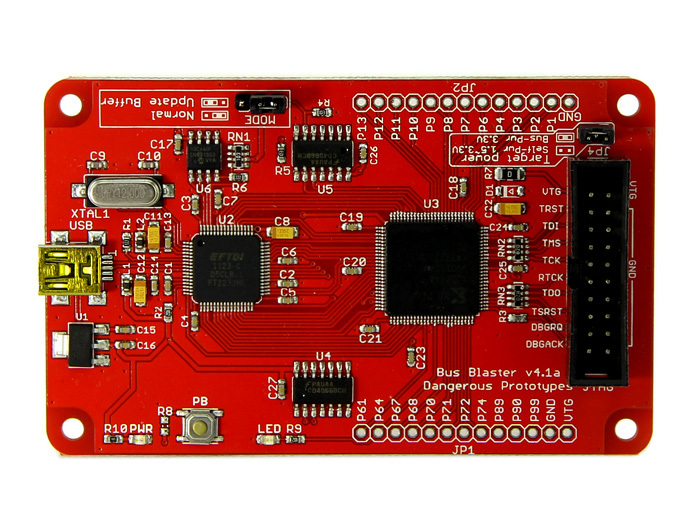 But based on experience working with these chips, I knew that the manufacturers try to keep the pinouts similar so that they are pin to pin compatible with other devices. 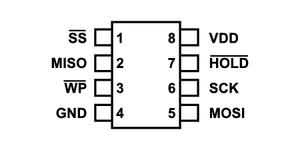 The flash had eight pins and by looking for common flash chips, I was able to find the appropriate pinouts. I started by looking at the spi signals, and the clock speed was very high at around 50 MHz. I used a Buspirate to try to read the flash chip. Flashrom is an excellent piece of software that can be used to read and write flash chips and it also supports Buspirate. I tried to read the flash, and I did not get any valid response, but during the process, I was able to find that the name of the flash chip was GD25Q128C by [GigaDevice][http://www.gigadevice.com]. I desoldered the flash and tried to read it again, and I was successfully able to read the contents of the flash to PC. The first thing I did after I read the flash was to run strings. But looking at the first few lines like the one below, I came to the conclusion that I had endianness problem. I wrote a small program in C to fix the problem. The above string after fixing the endianness got converted to an valid readable string as below. Binwalk is an awesome firmware analysis tool. Binwalk reads the flash file and does a search for different file type signatures and in the end gives you information about the location of various file partitions like uboot, filesystem, etc. It can also extract them for you too. Binwalk gave the following info for my file. I was able to extract the contents using the following command. Binwalk extracted the system directories, and I was now able to see all the files in the root directory. Now, I had to find the executable responsible for the limited shell. I searched for the string h1m0mz in the entire file system and was able to find the right executable. After disassembling the file and inspecting the flow of the code, I came across the section below where three strings were being concatenated using sprintf. The first part of the string was the challenge value printed onto the console and second part of the string was being read from non-volatile ram using nvram_get_safe(2) which had its value set to admin. 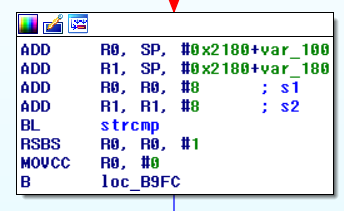 You can also see from the above figure that the concatenated strings are passed on to MD5 function. By now I had all the necessary components to generate the response string. I was very excited about my progress, and I directly jumped to my jupyter notebook and used the following to get the md5sum. I entered the above string in the ssh terminal, and I got no response. I was very disappointed and had to find a different way to solve the problem. Qemu is a generic and open source machine emulator and virtualizer that can be used to emulate arm architecture. I tried to run the executable using Qemu and to my surprise, I was successfully able to execute the program without any problems after I had fixed the paths for the library files. I wanted to use gdb to debug the code and stop at the point where the string entered in the terminal was being compared to the one generated internally. So I started the gdb server on Qemu and stepped through the code. The first breakpoint coincides with sprintf function call and second with strcmp. Arm architecture uses registers R0 to R4 to pass the arguments to the functions. I entered the string obtained from the gdb and entered into the console of the phone, and I got the following response. I used find to locate the oem file, and one more trick I learned was to use nc to transfer files over the network. After finding the oem file and executing it, I was able to locate the bitcoin key. And now I could finally call myself a Hacker.